The Gourmet offers a large space heating capacity up to 180m2. The unit features a good sized oven with a huge cooking surface on top and a self cleaning glass door with thermometer. The unique venting system makes for easy control of oven temperatures for all your cooking requirements. This impressive unit heats, cooks and provides enough hot water for the entire family when fitted with the optional hot water jacket wet back. The Gourmet is best placed in the lounge, dining or family room as a space heater but can also be sited in the kitchen as a cooker if desired. The hardworking Gourmet Cooker is a versatile unit that heats, cooks and supplies hot water to your household. With an impressive heating capacity of up to 180m2, it’s best placed in the lounge, dining or family room as a space heater, but can also be sited in the kitchen as a cooker. The Gourmet is a good sized oven with a huge cooking surface on top and a self cleaning glass door with thermometer, and the unique venting system makes for easy control of oven temperatures for all your cooking requirements. The oven comes standard with oven rack and tray. The firebox is located directly below the cook top, generating excellent hotplate temperatures, and the highly-placed position of the firebox makes loading of fuel a breeze – no bending down required. 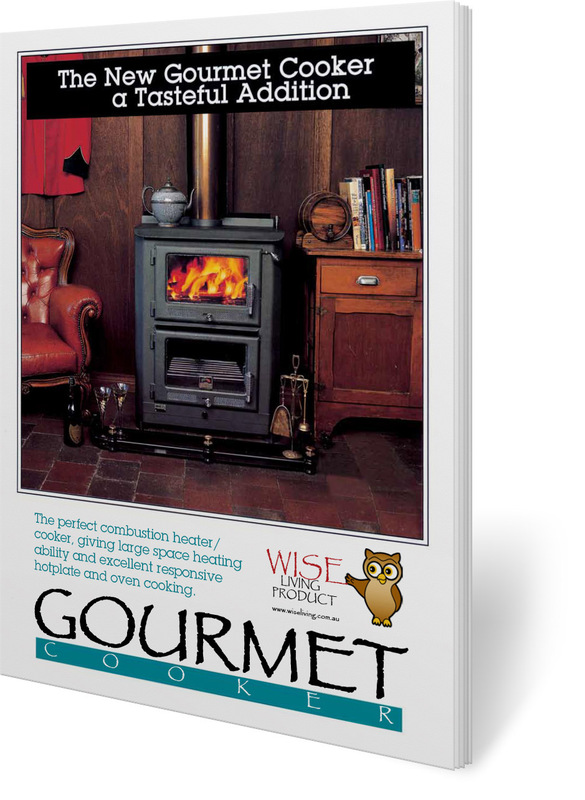 The Gourmet can burn coal but is more suited to wood, having both top and bottom air controls. It is also available in a central heating model with a boiler output of approximately 15kW - more than enough to heat the average three bedroom home. It’s available in five standard colours including moss green, blue, golden fire brown, charcoal and metallic black. It is also available with a chrome or brass trim with optional splash back. Mojave red is available at a small additional charge. All Gourmets are hand-built by experienced Australian craftsman, providing a level of quality and individuality not achieved by mass production.